This 2007 HUMMER H3 SUV is proudly offered by Discount Auto Brokers Inc This vehicle is loaded with great features, plus it comes with the peace of mind of the CARFAX BuyBack Guarantee. 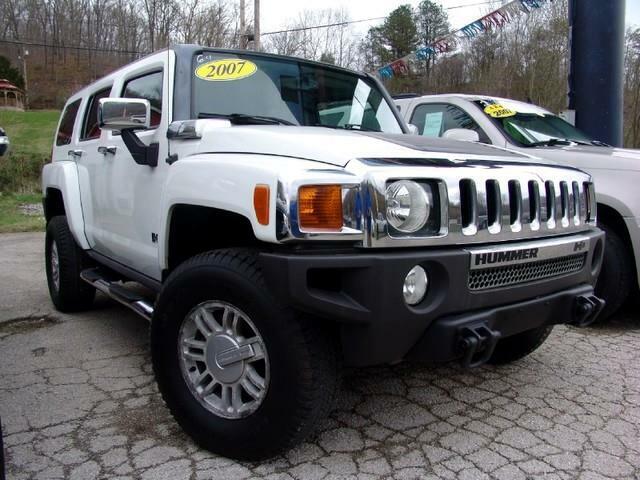 This HUMMER H3 SUV is an incredibly versatile vehicle that is a must have for any family. No matter the terrain or weather, you'll drive at ease in this 4WD-equipped vehicle. With exceptional safety features and superb handling, this 4WD was engineered with excellence in mind. Only Discount Auto Brokers Inc could offer you a HUMMER H3 with mileage this low on such a popular vehicle. More information about the 2007 HUMMER H3: The 2007 Hummer H3 may be smaller than the H2, but it is no less imposing wherever it shows its massive chrome grille. Physically, it is only five inches shorter, three inches less long, and 1,700 pounds lighter. This ends up translating to better relative fuel efficiency, with an EPA rating of 20 mpg on the highway. The H3 is priced at $24,705 less than the H2, making it a real value in Hummer-per-dollar. Interesting features of this model are Excellent off-road performance and Hummer appeal for less money.